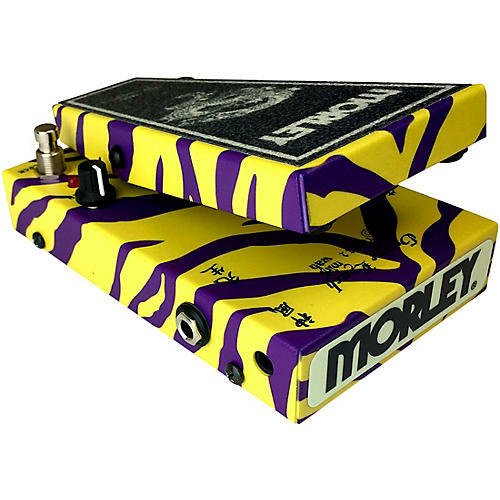 This limited-edition mini version of the Morley George Lynch signature Dragon 2 wah features electro-optical wah with three wah modes: Wah (traditional), Wow (bit of overdrive with unique vowel-like tone) and Wah Lock (allows user to electronically lock the Wah in Wah mode). A notch knob allows you to dial in the appropriate Wah frequency. It's decked out in yellow and purple tiger stripes and Morley's unique glow-in-the-dark Treadle Rubber. It's suitable for guitar, bass or keys, and is powered from one 9V battery or optional Morley adapter. It features LED indication, cold-rolled steel housing, quick clip battery door and a one-year warranty.